In the ongoing hunger strikes as part of agitation by veterans for early implementation of 'One Rank One Pension' a retired army havildar who was on a relay hunger strike was rushed to the Army hospital on 29 August after his health deteriorated. "Havildar Abhilash Singh has been taken to hospital. He was on relay hunger strike," an official from the United Front of Ex-Servicemen, the umbrella organisation of veterans carrying out the protest, said. Besides Singh, four others who were on fast-unto-death have been admitted to hospital after their health deteriorated. The deadlock over OROP continues even as the protest entered its 76th day today. 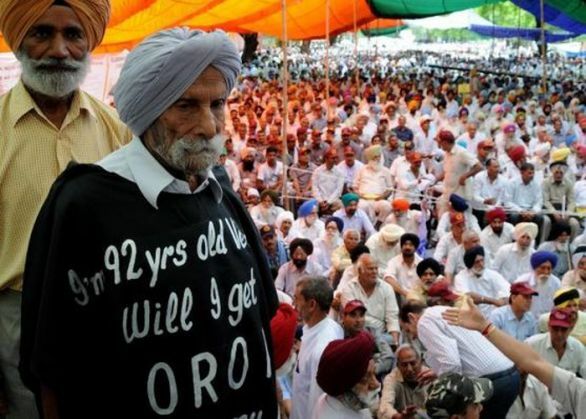 Yesterday the government had sought "some more time" to roll out OROP. Close to 22 lakh retired servicemen and over six lakh war widows stand to be the immediate beneficiaries of the scheme, which envisages a uniform pension for the defence personnel who retire in the same rank with the same length of service, irrespective of their date of retirement. Currently, the pension for retired personnel is based on the Pay Commission recommendations of the time when he or she retired. So, a Major General who retired in 1996 draws less pension than a Lt Colonel who retired after 1996.